The average American throws out a pound of food per day, mostly fruits, vegetables, dairy and meat, a new USDA study finds. That’s a total of 150,000 tons of food per year, enough to feed 2 billion extra people per year. Americans eating the healthiest diets are the most wasteful, because of their high consumption of fruits and vegetables, as opposed to highly processed non-perishable foods, which don’t go bad as fast. 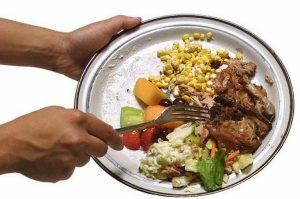 “We need a simultaneous effort to increase food quality as well as reduce food waste,” said study co-author Lisa Jahns, a USDA nutritionist. Another recent report by the Center for Biological Diversity found grocery stores are just as wasteful as individual consumers. Only four of the 10 largest grocery chains in the US have food specific waste reduction commitments. Another four chains don’t have any policy in place to prevent the waste of food considered too cosmetically “imperfect” to sell. 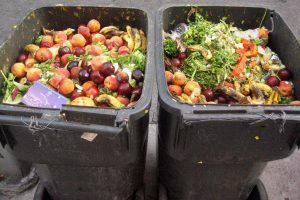 Walmart achieved the highest grade in food waste prevention, a B, while Aldi got the worst, an F. Trader Joe’s, Target and Whole Foods all received a grade D.
“There is just so much wasted food at so many levels,” said Jordan Figueiredo, who runs the “Ugly” Fruit and Veg Campaign and collaborated on the report. Figueiredo said there needs to be better funding for food recovery and wider use of composting, which is only available to about one in 10 Americans.